That's all from us today but join us again tomorrow for a big day of football. We'll be going live around 12:00 GMT. Arsenal take on Southampton while there's a huge game between Manchester United and Liverpool - both at 14:05 GMT. Chelsea also take on Manchester City in the EFL Cup final at 16:30 GMT. And don't forget Match of the Day is on tonight from 22:20 GMT on BBC One. Crystal Palace boss Roy Hodgson: "It was a very important victory for us. We dug in extremenly well and didn't concede many clear-cut chances. "I was really pleased with the way we established control in the second half and we put away our chances. You do need to maximise the chances that come your way. "We knew that if we could stay solid we have the players to be dangerous on the counter-attack. "Journeys home are always happy affairs or very unhappy, you have to live with both. Football has good times and bad times and I am looking forward to a day off tomorrow but then we play Manchester United on Wednesday. "It's quite strange that I was contemplating doing something else when I came back to England in 2007 and these last 11 years have been a highlight of my career. The important thing for me now is that I look after myself physically, I don't allow myself to give up and stay in the shape you need to be in to do this job." Roy Hodgson says he is looking forward to having a day off tomorrow! I would if I was 71. More from Leicester manager Claude Puel: "We finished the game with a lot of frustration. We had a lot of quality in the first half but then we conceded with their first shot, it's difficult to accept. "They played deep, we could not find space and we could not manage the situation. "We were in trouble at the end. It is normal for the fans to be worried, I understand this. The important thing is for the players to react in the next game and to have the support. The players need confidence, they have played well without fair reward in the last few games. "There is a way to turn our luck. We must keep a positive attitude. The most important thing is my players, not me." More from Leicester boss Claude Puel, whose team have not won in six games: "Of course it is a difficult and worrying time. We have played some good opponents without reward and of course we are in difficulty. "We have to take confidence and support with our fans, it is a young team and we need to keep a positive attitude. "I manage the pressure, the most important thing is my players. We are a young team and we have shown a lot of quality without a fair result. We have to keep going." Leicester manager Claude Puel, speaking to BT Sport: "I think we made a good performance in the first half with good chances and good play and then conceded the first goal with their first shot. "It was difficult to find a solution because they played and blocked but we tried a lot of good moves. "We came back with desire in the second half and then we conceded a second goal on the counter attack. "After the second goal we did not manage the game right. It was difficult to have structure and stop the counter attack." On whether a foul against Wilfried Zaha in the build-up to the first goal should have been given: "I think it was not a foul just before the goal. They came in our half one time and we concede a goal. We are not lucky in this moment. We have to keep going and keep our desire." Since his debut in February 2017, Luka Milivojevic has scored 20 goals for Crystal Palace - more than any other player. Crystal Palace forward Wilfried Zaha on his side's thumping win: "It is a massive result. Obviously we're trying to keep the run going and we came here and did what we had to do." On his first goal: "I was just making sure I got a good connection on the ball and hit the target, I'm just happy to help the team." On Leicester complaining about a foul in the build-up to the first goal: " Whatever they're angry about doesn't bother us. Definitely it was a foul. But it's up to the ref to decide." On Eagles manager Roy Hodgson celebrating becoming the Premier League's oldest manager with a win: "I'm sure he's buzzing because what he has set out for us to do we've got down to a tee." Tune in from 10:20 GMT for Match of the Day! Crystal Palace forward Michy Batshuayi: "I am happy, the important thing is the three points today." We are aware that we have had some technical issues with the site in the last hour or so which is why the score is showing incorrectly in some places. Apologies and I can assure you that it is being worked on as we speak. James Tomkins is awarded the Man of the Match award and the interviewer asks Wilfried Zaha to give it to him. "Oh wow, really? Okay! ", Zaha jokes as his disbelief is clear to see! It's a huge victory for Crystal Palace. Fair play to come away from home and score four goals. They were very clinical but you have to give the two centre halves the credit. They gave Jamie Vardy a tough afternoon. They set up to score on the counter-attack in the second half and it worked. Leicester lose four consecutive home Premier League games for the first time since January 2000. Wilfried Zaha has been devastating with the finish. It was a mistake from him and Harry Maguire has been so poor today. 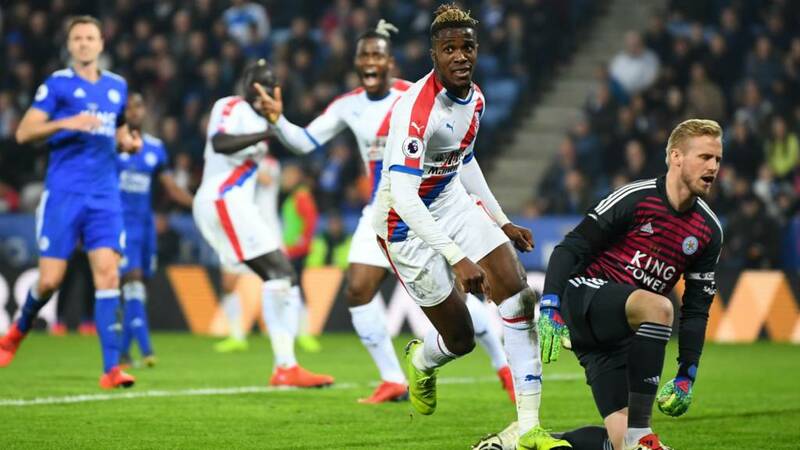 It's the perfect break from Crystal Palace and Kasper Schmeichel will also be disappointed as it went through him. All over. Roy Hodgson has had a very enjoyable day on a Saturday when he became the oldest manager in the history of the Premier League. Claude Puel is starting to feel the heat. Jordan Ayew wins the ball in midfield, charges forward and slips it right to Wilfried Zaha. The winger slams it into the back of the net. Easy as you like. Leicester have fallen apart. Vicente Guaita comes out bravely to take the ball in as Jamie Vardy is looking to get a touch at the back post. He gets a nick off the striker and goes down but even his own fans are urging Guaita to get on with it. The medical staff don't show much sympathy either!